A highly range restricted species (EOO 1 km²), known from a single location where it is potentially threatened by livestock grazing and trampling as well as succulent collecting. Plants occur on land that is used for livestock grazing. Habitat degradation as well as trampling is a potential threat. It is a rare and localized species and therefore may also be potentially targeted by succulent collectors. This species is localized to a single ridge where it is locally abundant, with the population consisting of more than 1000 individuals. Rodgerson, C. 2006. 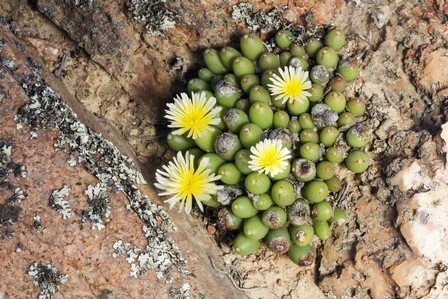 Conophytum bruynsii. CactusWorld 24(3):114-116.